ATTENTION STAR JONES: WHO IS NENE? Thingy-something that is, but should not be, so isn’t significant enough to exert any effort to denote substantively, more or less acknowledge with a credible identifier. Ghetto Sophisticate-An individual with the perfect mixture of finesse, and a small measure of refined decorum, whose persona could be construed as such until the core of ghettoism is detected, usually through elongated or recurring interactions, or through observation of the person during challenging circumstances; The complexity of the ghetto sophisticate becomes alarming when ignorance precludes and outweighs sound behavior. This here situation is a thingy. 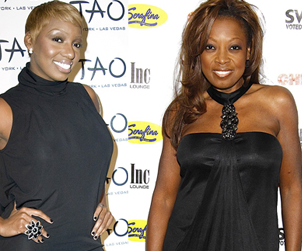 Now, I tried not to posit a single opine on this reputed cat-fight between Star Jones and NeNe Leakes. Of course, this could all be hype to buffet careers because that is what a good dose of drama does, nowadays. Nonetheless, if the alleged feud between Star Jones and NeNe is true, I need to talk to Star. Who knows where the feud began and what the root of it is. 1. Tell your friends who disclose your so-called side of the story to the media, to stop blabbing. If you really aren’t talking, they shouldn’t be talking. If they want a check that bad, they are not your friends. 2. Don’t use #1 or yourself to funnel information to the media at all. You know this thingy could spin and jump you in an instant with the media. If a blabbermouth keeps rattling and you don’t respond, all the people with good sense will know that you are above this thingy. So, don’t do anything that’ll associate you with the fringes of a NeNe Leakes story. 3. Allegedly, you have tweeted some “throw-off” lingo which could be directly attributed to NeNe. Why give her any more publicity? Why? Who, the heck is NeNe? Really? 4. You are an accomplished woman who has spent a long time in considerable stardom, even having survived a fight with the power-house, Barbara Walters. Your choices for weight-loss, marriage and so on, weren’t only yours because you had been a public figure for so long that incredulous people-who had to be part of the populace of undiagnosed mental patients or people without enough business of their own-had to focus on the details of how your fat left, why you had such a lavish wedding, and why you didn’t trust complete strangers to just tell them the truth. You know the cycles in entertainment because you’ve been there long enough. Let it ride. 5. Your accomplishments didn’t begin when Barbara Walters slated you for The View. Television didn’t make you. You were graced to be chosen, but you had something to bring to the table. You helped make day-time television and received the benefits and drawbacks of celebrity-ism, just like all the rest of so-called stars. I’m sorry, why was NeNe cast in Housewives of Atlanta? Because??????? We’ve noticed that the housewives who are distinguishable ladies with a real clue of how to handle wealth, notoriety, family life and a career (be it philanthropic) haven’t lasted on the show. They have had the wherewithal to leave while they still had good will and dignity. NeNe is the show favorite, just about. What does that tell you, Star? You know deductive reasoning. 6. So, Star, be careful about this one. Anyone who has supplied sufficient footage for editors to drench her air-time talking about her so-called friends with no loyalty to anyone but herself, snapping on everyone around her, and stating who she can and cannot tolerate-as if she is the standard and any type of quintessential point of reference to other people’s existence-is not someone who you need to even be associated with, in another nasty public beef. 7. One day, NeNe is going to look at the footage of herself, and how she has chosen to ride the wave of opportunism because the buck is working for her now, and realize that she should have used that loud mouth to contribute to the world around her. I’m sure there’s something in NeNe that could edify the real portrait of exemplary Black women. Until the ghetto sophisticate with a suburban life can begin to function with this conciousness, you shouldn’t be a significant part of this here drama when her reflective reels are spinning. 8. NeNe has a history of apologizing when she realizes she is wrong. We don’t know who the culprit is, if it is both of you, or what. Somewhere down the line, this beef will be squashed, NeNe will be over this celebravado and realize that her volume of fans today, doesn’t necessarily reflect a volume of respectability. We don’t need two more Black women railing against each other in public. Star, stay where you live. Ride the waves on this one, and let it go. Trump has enough money and doesn’t need you to suffer the expense of heightened buffoonery. i didn’t know about the feud, but i’m familiar w/ nene when i suffered temporary brain damage and watched HOA.